An interesting article on the Guardian unlimited web site today about how Harry Potter books have transformed the publishing company Bloomsbury, for better or for worse. The success of the Harry Potter is so undeniable that it is appropriately described as a “the greatest phenomenon in publishing history” by Bloomsbury founding editor Liz Calder. The effect on Bloomsbury however is still uncertain; JK Rowling’s magically mastered success has provided the publishers with a tremendous amount of available cash. If this cash is used wisely it may well keep Bloomsbury in it’s position of the “most successful independent publisher in Britain by far”. This cash, competitors are complaining, has enabled Bloomsbury to steal numerous deals from under their noses. Bloomsbury is also in the news for having just started offering digital downloadable versions of 24 books. This venture also seems to be in light of Nigel Newton’s (chief executive of Bloomsbury) will to find an interesting way to counter Google that is offering parts of the book for free. Newton said “Google I do have a problem with, as they’re giving away segments of books for free”, see this post on the BookFace blog for more details. This leads to another discussion on the value of Google scanning books and this blog seems to give Google reason too easily when discussing inappropriate advertising. It seems a bit naive to me to say well magazines do it so why criticise Google !? Financing such a project is obviously important but not at any cost. It refers to another article from the Guardian (this article is from a speech by Newton and is also referred to in the BookFace blog). I have already discussed how I feel that Google’s AdSense is not a good service when you can’t choose not to display certain adverts, especially when they turn out to be your close competitors ads ! Further reading on this topic lead me to a blog by Mike Collins and an article about how Amazon seems to have frightened publishers somewhat with new services allowing for people to access digital books from anywhere in the world. Novel concept there : being able to access content from anywhere in the world, sounds a bit like a thing called the World Wide Web ! This stance of fighting for the old way things used to be done and trying to stop anything changing was what lead the music industry to the MP3 fiasco. It sounds like, rather than look at ways to adapt the old to the new, it’s once again the will to stop change at all costs that is getting the better ! 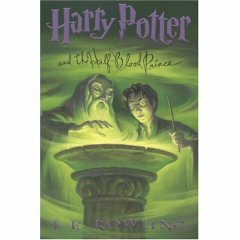 I wonder how the UK edition of Harry Potter is different to the US edition ! ?